Choosing a backpack for day hiking might seem like a daunting task. You walk into a large outdoor outfitter and they line the walls, in all colors and sizes. Some have lots of little accessories. Some are huge and some are small. Some have internal frames, whatever those are. Some have hydration sacs, which sounds a little funky. Some cost more than your monthly car payment. How to figure out what you need? And why can’t you just dig out that old one you used in college? The backpack that’s right for you has to be the one that’s right for you. Deep, isn’t it? I’m serious. Backpacks are a very personal matter, because your back is a very important part of your body. If you’ve ever had a back injury, you’ll know that when your back isn’t in good shape, everything becomes more difficult. So do yourself a favor, and take the time to find the backpack that will keep your back in good shape. First of all, that old backpack you used in college isn’t a good idea for hiking, at least not serious hiking. 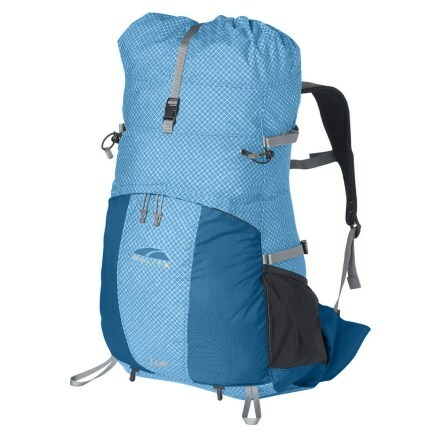 In a pinch, for a short hike, you could make it work, but hiking backpacks are designed to hold more in an efficient way that allows you to access your supplies readily, and they are designed to fit you properly to distribute the weight, let you keep your balance, and save your back (and shoulders). So, what should you look for in a day hiking backpack? Woman-Specific Packs: Manufacturers got smart and finally started making packs that are specifically designed for women. While I’m not 100% in favor of some women-specific items (see my grumble about “women’s” first aid kits), in the case of a backpack it’s essential. 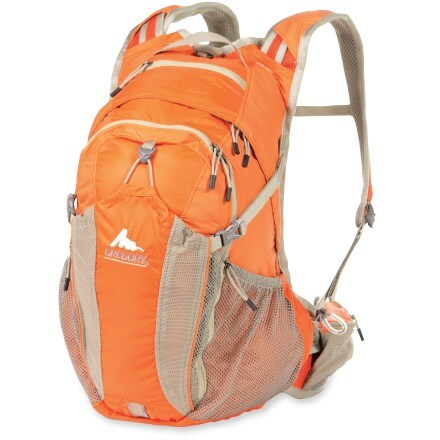 Women’s backpacks are built to fit women’s torsos, which are generally shorter than men’s torsos; this way, the pack can sit on your hips (where the weight should be focused) and allow the shoulder straps to fit as well. The shoulder straps themselves are contoured differently than men’s to account for…well, breasts. All of this means that the packs designed for women will not only be more comfortable for you, but are also better for you. Storage Space/Configuration: Every pack is different, and you might not know precisely how much space you need until you try it out, and there is a broad range out there (at least as broad as 1000 – 2300 cubic inches). I can honestly tell you I’m not sure how big mine is, but I’m going to guess it’s around 1700 cubic inches. It’s important to remember that you don’t always have to stuff it full, so if in doubt, go with something on the upper end of the range. As to configuration, take a look at how the pack is constructed. I like multiple compartments (a primary and a secondary and maybe one more small one) in order to divide up gear. I also like a couple of pockets on the sides (so I can stick the GPS, an apple, etc. for easy access), and handy loops so you can attach other things if necessary. Water System: It’s up to you whether or not you get a pack with a hydration system, but I think it’s worth the extra cost. There are packs with hydration sacs that hold a couple of liters of water (I’ve found to be plenty for even a significant day hike as long as it’s not a million degrees), and provide for easy hydration while on the go. It eliminates the need to carry separate water bottles — but if you aren’t in the mood to use the sac, you can remove it. One hint: don’t put anything but water in there, because it can be a royal pain to clean. Fit: Yep, you get to go shopping. Try the packs on. Connect the waist strap. See how it distributes weight between your hips and shoulders. See how the straps feel. Don’t be afraid to walk around the store for a bit to make sure it’s what you want. Because day packs can cost anywhere from $75 to several hundred dollars, take the time you need to make the right purchase. Don’t forget to enter Her Side’s first CONTEST!!! Deadline is Friday, February 5th, and so far we haven’t met the minimum entries…tell your friends!